Yesterday’s Giving Blueday 2018 was a full twenty-four hours of clamoring social media feeds, pleading emails, and sneaky Venmo requests. University of Michigan students fought tooth and nail to fundraise for their organizations -- MUSIC Matters in particular united under the objective to surpass last year’s success of $27,000 in Giving Blueday donations and to reach $30,000. With the help of our charitable alumni and donors, MUSIC Matters triumphed one Giving Blueday challenge after the next, motivated by the knowledge that proceeds will support SpringFest, our lifestyle festival that brings together the Michigan community and funds our student-driven social ventures. Giving Blueday is an exciting time of year, but we realize the greater takeaway from this season of giving: we passionately advocate for and give to causes we care about not because we want to dominate the competition of fundraising challenges, but because we are recognizing our own blessings and want to give back to those who may not have the same resources that we do. 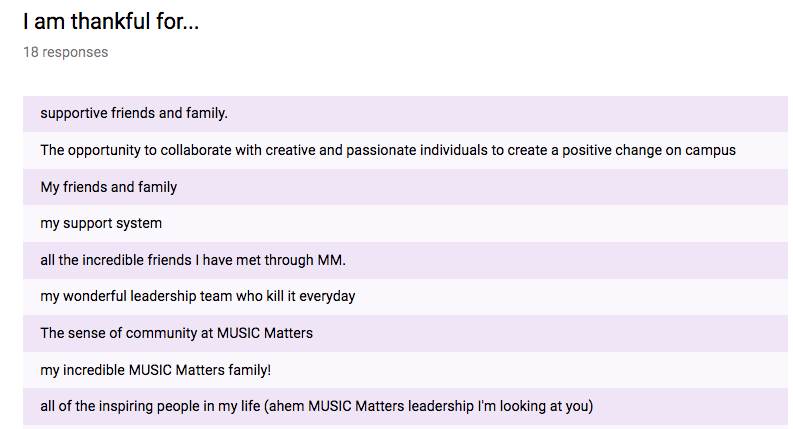 To emphasize humility to our MUSIC Matters family before we dove into the pandemonium of Giving Blueday, we asked our members what they were thankful for. Responses were instantaneous, and many overlapped! With these blessings in mind, our MUSIC Matters team proceeded to fundraise for our organizations with fervor. Many of our members have expressed thanks and admiration for the authenticity of our social ventures and fundraising efforts. Thus, post-Giving Blueday, and every day, MUSIC Matters advances with pride in our missions. A lot has been accomplished in twenty-four hours, but with the constant support of each other and our donors, MUSIC Matters will cultivate social change to last a lifetime.